Join us in building the movement to solve the climate crisis through elevating climate justice, working to keep fossil fuels in the ground, advancing fossil fuel divestment efforts and promoting local solutions. Join one of our committees and ongoing campaigns. Legislative Committee – Educate and push elected officials to take strong positions on climate change, track policy efforts, pressure legislators for more bold climate action, organize Lobby Days at the Capitol and continue the momentum of our People’s Climate Justice Platform. There is also a subcommittee focused on promoting the Green New Deal. Sign up here. Fracking Committees – Continue our work to stop hydraulic fracturing and horizontal drilling in Colorado. This committee works to protect communities from fracking and collaborates closely with partner groups and impacted communities. If you are interested in addressing fracking on public lands, you can also join the Fracking on Public Lands Committee. Sign up here. Defunding Climate Disaster/Divest-Invest Committee – Defund the climate crisis by promoting divestment from fossil fuels, including a Fossil Free PERA (Public Employees Retirement Association) campaign and a Public Banking subcommittee working to advance public banking in Colorado. This group also focuses on defunding big banks who are financing extreme fossil fuel projects. Sign up here. Regenerative Agriculture Committee – Fight climate change with your fork, promote food grown locally using organic methods, regenerative agriculture and carbon sequestration.Sign up here. Renewable Energy Committee – Promote the just transition to 100% renewable energy, and promote opportunities to reduce energy consumption and transition to clean, renewable energy – including the promotion of solar, wind, geothermal, and other clean renewable energy through policy and education. Sign up here. Moving Beyond Coal Campaign – Our Colorado Springs Team is actively working in a coalition with the Sierra Club and other local groups in the Pikes Peak Clean Air Coalition to bring an end to the last remaining coal plants in Southern Colorado. Sign up here. Fundraising Committee – Help power the climate movement by amplifying fundraising efforts. Sign up here. Join a Local 350 Colorado Team. 350 Colorado has local teams across the state working on a number of local issues. Each month, groups meet around the state to host events and presentations and plan for local actions. It’s a great way to meet people working to solve climate change in your community and stay involved. Join a local 350 Colorado team near you. And – if there isn’t a team in your area, consider starting one! Contact our Volunteer Coordinator Amy here to learn more. However you choose to stay engaged, we look forward to our continued work together this year! Who are 350 Colorado Volunteers? We are motivated Coloradans from all walks of life that are working hard to build the climate movement in Colorado. We all have unique skills and motivations, but we have come together to form a community of climate protectors! We are committed to ensuring a livable climate for all and are focused on promoting local change through grassroots advocacy. Join or lead a local team (check out a full list of our teams here) – attend monthly events to learn more and get involved with local action planning. Become a clicktivist! Sign online petitions, share social media posts, send emails. Help organize a local campaign on one of our areas of focus. Hit the streets and petition! Assist in marketing and public relations. Help us build our information base by doing some research. Communicate and educate others on climate change issues. Attend an upcoming event or planning meeting. Check out our calendar. Want to learn more? Email volunteer@350colorado.org to learn about volunteer opportunities and so we can connect you with an active volunteer. Want to learn more about our specific committees and campaigns? 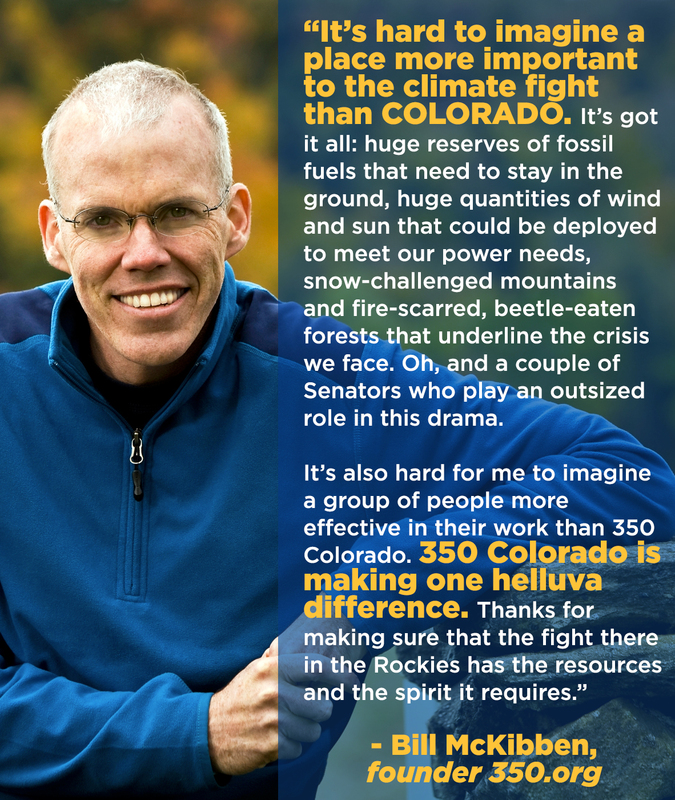 Email campaigns@350colorado.org to learn more.